In November 2009 the National Rugby League (NRL) announced its first Indigenous All Star team which played the NRL All Stars in a pre-season game on February 13, 2010 (two years to the day since the Australian government's apology to the Stolen Generations). Preston Campbell who was part of the team tells his feelings when he visited his home town : "I realised that the support [shown by his people] was not just for me or even the team. There was a sense of pride that we were representing them and that the game had recognised Aboriginal and Torres Strait Islander peoples and the special relationship we have with rugby league. And I also realised that we were representing those who had gone before us and that we were also fulfilling their dreams." "We will take the spirit of our own mob on to the field and that will give us the personal strength to take on the might of the assembled NRL All Stars. We will also carry a special strength generated by the game commemorating the Stolen Generations on the second anniversary of the apology given by the Prime Minister [Kevin Rudd], who will be at the ground. This will have a special meaning for a number of the boys, including myself, whose family histories were affected by those times." "All these emotions will come together in a collective sense of pride in our culture and our history. Many people say we will be making history. I would like to think we are honouring history." The Indigenous All Stars won 16:12. The Indigenous All Stars were : Carl Webb (Cowboys), Cory Paterson (Knights), D Laurie (Panthers), George Rose (Sea Eagles), Greg Inglis (Storm), Jamal Idris (Bulldogs), Jamie Soward (Dragons), Jharal Yow Yeh (Broncos), Joel Thompson (Raiders), Jonathan Thurston (Cowboys), J Hodges (Broncos), Nathan Merritt (Rabbitohs), PJ Marsh (Broncos), Preston Campbell (Titans), Sam Thaiday (Broncos), Scott Prince (Titans), Tom Learoyd-Lahrs (Raiders), Travis Waddell (Raiders), Wendell Sailor (Dragons, his last match), Yileen Gordon (Bulldogs). The first Australian Aboriginal rugby league team was assembled in 1973 for a February match against Auckland club Te Atatu, which the Aboriginal side won 17:13 . There is another team believed to be "the inaugural Indigenous All-Stars" which played at Sarah Oval, Mildura, NSW, on Sunday 1 October 1983 . The team was coached by Michael Wanganeen, uncle of Gavin Wanganeen. The All-Star side won with 233:95 points. Backs: Cecil Graham (Centrals), Ron Jackman (Coomealla), Peter Carter (West Torrens). Half Backs: Phil Graham (Centrals), Wilbur Wilson (Centrals), Phil Egan (Richmond). Centre: Kevin Hill (West Torrens), Maurice Rioli (Richmond), Mark Motlop (Glenelg). Half-forwards: Robert Keeble (Greenacres), Colin Graham (Centrals), Greg McAdam (North Adelaide). Forwards: Rex Handy (Coomealla), Robert Muir (St Kilda/West Torrens), Wally Lovett (Richmond). First Ruck: Stephen Michael (South Fremantle), Phil Krakouer (North Melbourne), Jim Krakouer (North Melbourne). Interchange: Michael Graham (Sturt), Garry Berry (St Kilda), John Mitchell (Coomealla), Trevor Handy (Coomealla), Macca Egan (Robinvale), lan Berry (St Kilda), Barry Kirby (Coomealla). Coach: Michael Wanganeen, Team Manager: Fred Warrior, Runner: Brian Warrior. Aboriginal umpire: Barry Buckskin (Riverland). 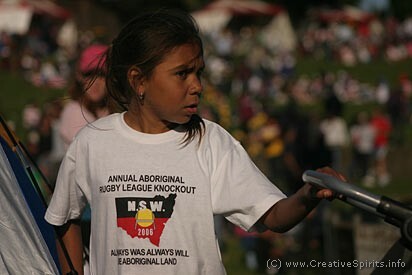 Young supporter of the Aboriginal Rugby League knockout. The annual NSW Aboriginal Rugby League Knockout is one of the biggest social, cultural and sporting event on the Aboriginal Calendar in NSW, and is family-friendly and alcohol-free.